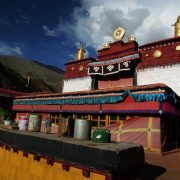 The Shangpa Foundation is a non-profit support organization, international network, and an online educational resource for the Shangpa Kagyu lineage of Tibetan Buddhism. We are interested in advancing research on the Shangpa lineage, and host educational and cultural preservation initiatives that sustain and enliven this distinct tradition within contemporary contexts. Working with the representatives of the living tradition worldwide, the purpose of the Shangpa Foundation is to uphold, promote, and share understanding of the genuine depth and spiritual heritage of the Shangpa yogic lineage. Our vision is to further the preservation, study, practice, documentation, and diffusion of the Shangpa lineage. We strive to provide these services through the diverse activities of the foundation. Long ago in 11th century India, two extraordinary women perfectly realized the state of Buddha: the Wisdom Dakinis Niguma and Sukhasiddhi. The learned and accomplished Khyungpo Naljor (11-12th Cent), who left Tibet seeking India’s most precious teachings, met them and received from them the teachings that became the basis of the Shangpa Lineage. Due to the wisdom and compassion of all the masters who were the subsequent holders of this lineage, the tradition has been authentically transmitted down to the present day in an unbroken lineage from master to disciple, fully preserving its richness and vitality. Khedrub Khyungpo Naljor was regarded by Jamgon Kongtrul to be the greatest Tibetan master after Guru Padmasambhava of the 7th century. Khyungpo Naljor established his seat at Shang-Shong in the Yeru Shang valley, which is how he came to be called Lama Shang and is the source of the name “Shangpa Kagyu.” Among the vast amounts of teachings that he received, five cycles stand out in particular, and continue to form the core of the Shangpa teachings to the present day. These are the teachings of two Jnana Dakinis, Niguma and Sukhasiddhi; of Vajrasanapa; of Maitripa; and of Rahula. While not established as an institutional school, the Shangpa Kagyu is one of the “Eight Tibetan Traditions” of transmission. This unique tradition of the Shangpa is alive today, transmitted in full within the Dashang Kagyu yogic lineage. It is also found in the midst of various other Tibetan schools and was cherished among many preeminent Tibetan masters of diverse lineages. It is a pure yogic lineage of Vajrayana Buddhism, transmitted from master to disciple through initiation and sacred commitments (samaya).